Family enjoying a scenic walk through the Adelong Falls Gold Mill Ruins in Adelong. The Man from Snowy River is not the only hero of Banjo Paterson’s famous Aussie poem. In fact, it is the craggy mountaintops, slender gums, rocky riverbeds and wide blue skies that keep drawing families back to the Snowy Mountains. As the snow thaws away, ski slopes turn into the perfect downhill bike run. Grab a helmet and hit the elaborate network of trails across the region. Brave and experienced riders can shoot down the infamous Thredbo Cannonball Downhill, or you can try the softer Pipeline Trail or Thredbo Valley Track. 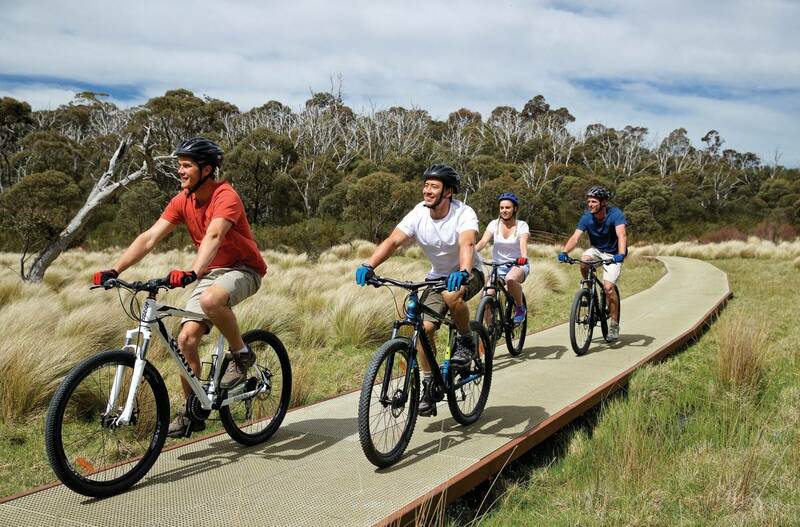 There is a whole selection of mountain bike escapades at Cooma’s North Ridge Reserve, at Lake Crackenback Resort or on the wide fire trails at Perisher. You can hire your set of wheels in Cooma, Jindabyne or Thredbo. Fancy yourself an Akubra-wearing, brumby-chasing hero of poetic proportions? 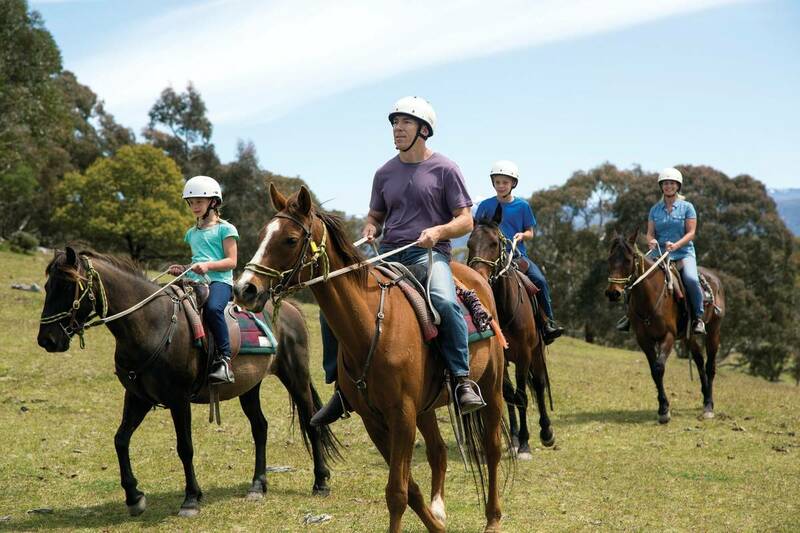 Whether you’re a horse fan, a Banjo Paterson fan or simply up for a kid-friendly caper with a difference, there is no better way to traverse the high country than in the saddle. Cross icy streams and subalpine terrain on a one or two-hour bush ride with Thredbo Valley Horse Riding or Yarramba Horse Riding. 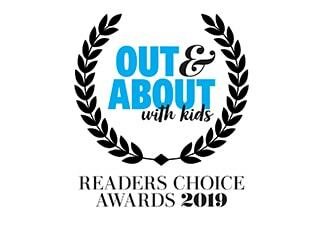 Little drovers can take a lesson or a quick pony ride, and seasoned riders can try a multi-day horseback trek with Snowy River Horseback Adventure or Cochran Horse Treks. Dismount to see the sights on foot. 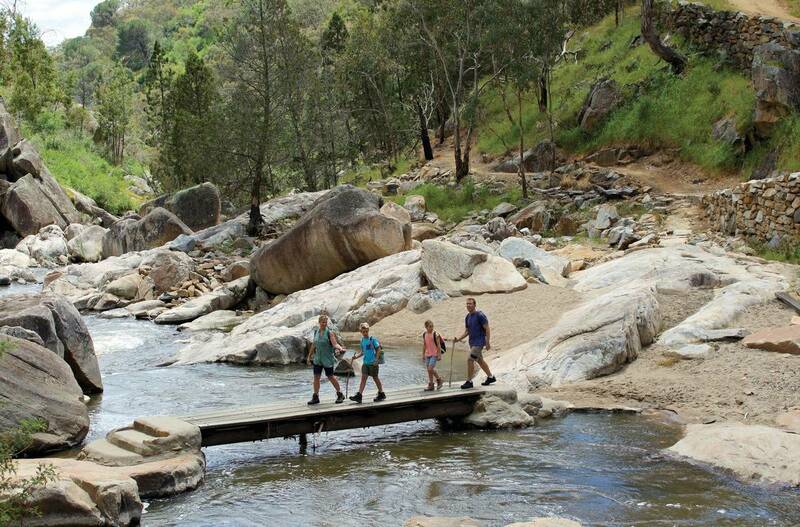 There is certainly no shortage of overnight hikes or bushwalking trails in the area – from the Jagungal wilderness to the whopping heights of Australia’s tallest mountain, Kosciuszko. Start the climb at the top of the Thredbo chairlift and either stop at the lookout point or continue to the peak. Alternatively, follow the footsteps of famous explorers and complete a segment of the Hume and Hovell Track, or check out the Cascades walk of Cooma to see Tuross River. 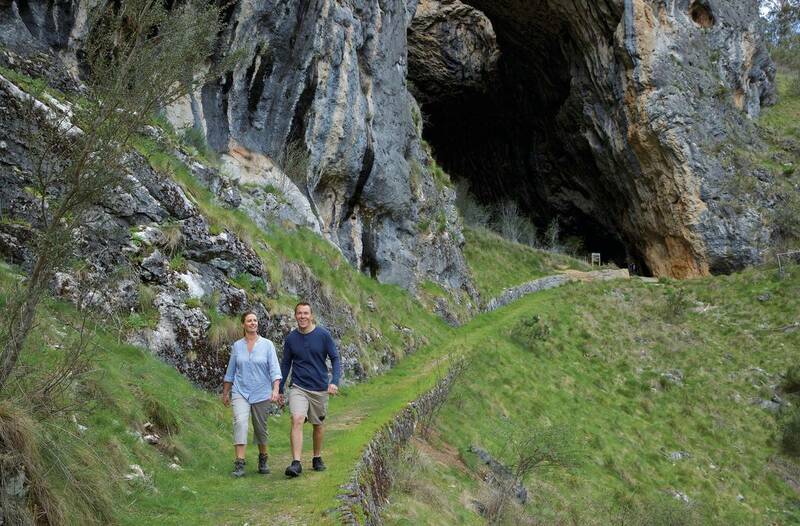 Visit tourist centres for maps or inspiration for a walk that suits your family! 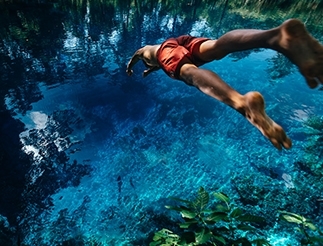 When the mountains are blanketed in winter white, going for a swim in the Snowies’ lakes and rivers does seem crazy. 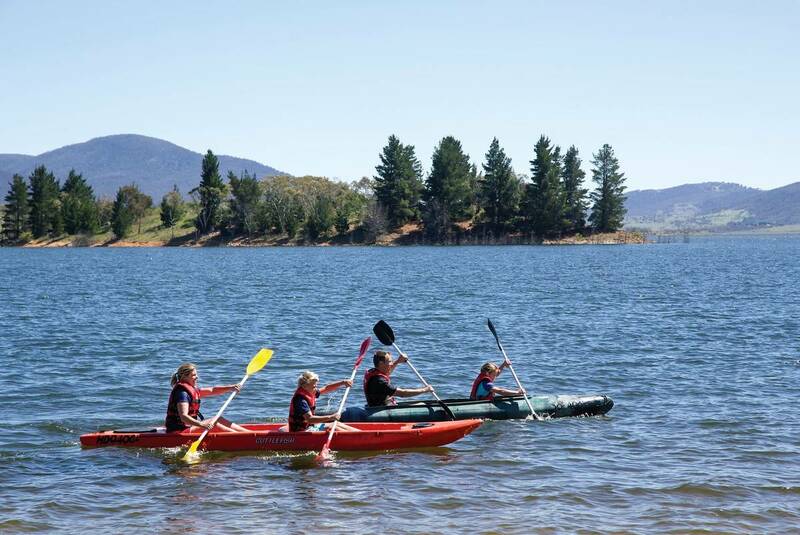 But in the summer sun, you’ll love canoeing, windsurfing and waterskiing on Lake Jindabyne and Lake Crackenback. The waterways are also full of trout, Murray cod and golden perch. Hire some fishing gear, register for an inland angler’s license and throw a line in at Eucumbene, Jindabyne and Khancoban. You can take fly fishing lessons with Dave Tucker at Tumut. And at the family-friendly Eucumbene Trout Farm, you can even eat what you caught fresh from the barbecue. There is a lot of ground to cover if you want to see all the highlights of the Snowies, so pack your picnic basket for a day trip by car. Three awesome routes to consider are the Alpine Way, Snowy Valleys Way or Monaro Highway. Visit historic townships of the north, like Adelong, Talbingo and Batlow, famous for its apples. Use bigger centres like Cooma, Adaminaby and Jindabyne to learn about regional history, including the Snowy Hydro Scheme. Tick off natural wonders like Mt. Kosciuszko and Yarrangobilly Caves. Make sure you have a map!